Today is the 10 year anniversary of owning our house! I'm almost shocked writing that. I really can't believe it's already been a full decade. Lately we've both been so busy with work that the date more or less snuck up on us. I didn't even realize today marked our anniversary until yesterday evening as I left the office and started to think about what I wanted to post about today. But to be completely honest, when I look at what we know now, who we were when we started, and what we've learned along the way, I'm not surprised that it's been 10 years but do feel shocked that it's gone by so quickly. I fondly remember the days and weeks of searching for a home. I recall, just like it was yesterday, the euphoria of settlement day and beginning work on our house only a matter of minutes after signing on the dotted line. We figured the hard part was behind us, but ultimately would know better. Few times in my life have I felt such eager anticipation and downright fear at the same moment. 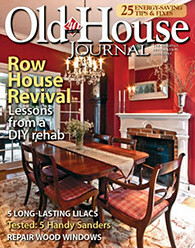 Without any prior experience on home projects of our own we had little idea of our capabilities, no discernible DIY skills, no understanding of the exorbitant amount of time even the seemingly simple tasks can require, and no comprehension of the tremendous amount of patience required to ensure the outcome of any given project is executed to the highest standards. To say we were naive, inexperienced, foolish, or even noobs, would be reasonable if not an understatement. 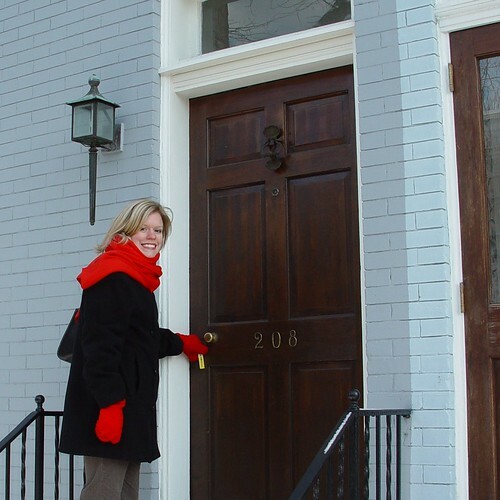 It's always fun to look back on the early days of our home ownership in a little "how far have we come" retrospective. Today, in honor of our 10 years of relatively successful home ownership, we'd like to share with you some of the top moments we've experienced in our home, both of triumphs and "lessons learned." Hey, life's not perfect nor is it predictable, so there's no harm in reveling and laughing at the the items that have ultimately shaped our experience. 1. Paint stripping is hard! When we bought our house we had so much vim and vigor that we thought we'd move in, get to work, rip through the whole renovation, and be done in about three years. House flipping was gaining popularity (remember, this was 2003) and if those people could do it, why couldn't we complete our work in the seemingly huge amount of time of three years? As I mentioned, we were working on our house within 15 minutes of home ownership, but it wasn't until about a day or two later that we realized this wasn't going to be a walk in the park. 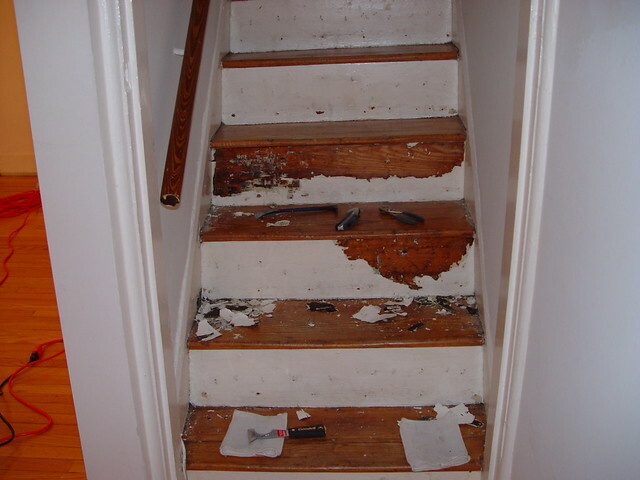 I expected old paint to more or less fall off of the molding and doors that needed to be stripped. We expected the house to have no problems with existing items like plumbing, electrical, or a leaking skylight. To put it lightly, we had no effing clue what we were doing. 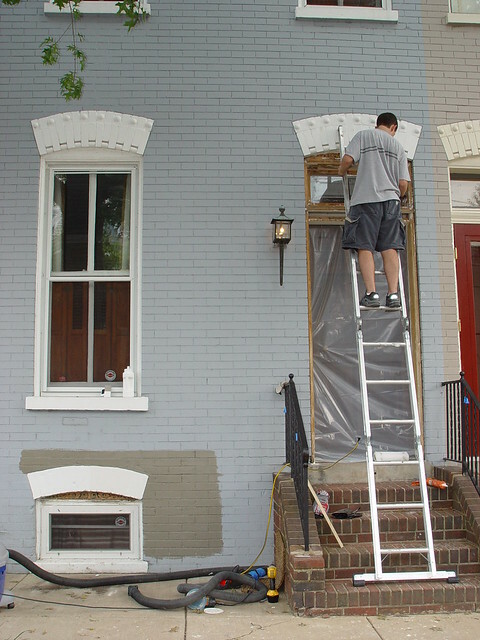 After running headlong into several projects we thought we could complete before moving in three weeks later, we realized just how hard and time consuming it was to strip paint. 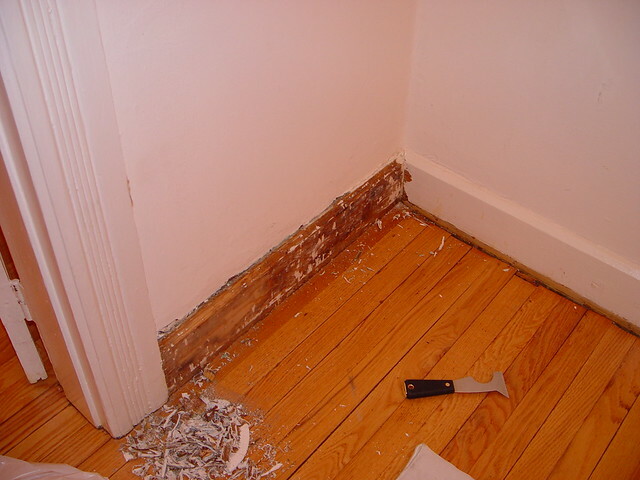 Using the heat gun I stripped about two feet of baseboard in about an hour. After 10 years, nearly all surfaces that needed stripping in our home have been freed from the bonds of lumpy and dripping paint, but it sure wasn't easy. It looks great now, but if there's a lesson to be learned it's simple. 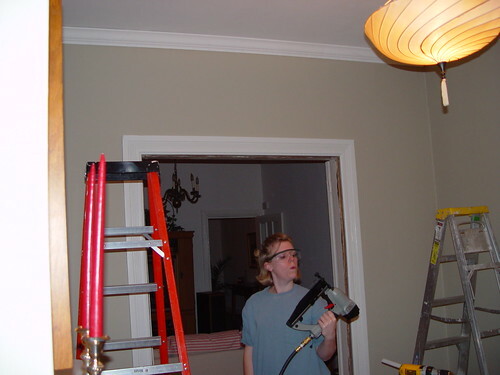 We're never going to buy another house that requires us to strip every door and molding. Instead we're just going to look at the many layers of paint as character and call it a day. I don't care how good your real estate agent is or how much you trust them, unless they are family (and sometimes not even then), don't use the inspector they recommend or suggest you use. 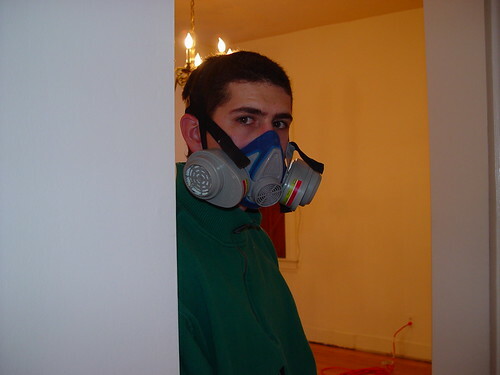 A home inspector is there for you, the home buyer. If your agent has a relationship with an inspector, the agent is putting money in that inspector's pocket. If the inspector feels they owe the agent something, they will try to make sure they don't do, say, or report anything that will make the sale fall apart, because if the sale falls apart they are costing the agent money and time. If you read the fine print of your inspection agreement, the inspector isn't financially responsible for anything they miss in the report. 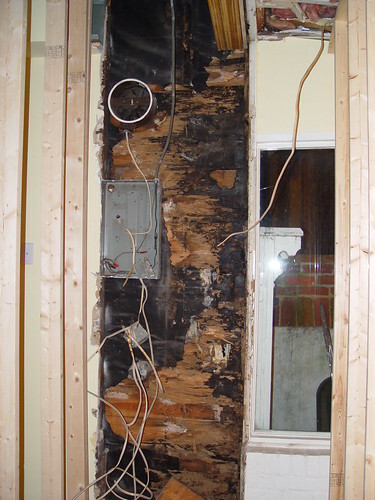 We learned this lesson the hard way by using the inspector that was recommended to us by our agent. After discovering some "issues" this inspector had missed, we paid for our own inspector (JD Grewell) about a year later to do a basic assessment of our termite structural issues that appeared. He was simply shocked at some of the things that had been overlooked. We were lucky that we could handle a lot of the issues he identified ourselves, but had we known what we were facing going into our home purchase we would have been better armed with knowledge for what was to come and possibly made better decisions on our purchase (like asking for additional money back to fix the issues). Leaky skylight that we "probably shouldn't worry about." This minor detail counts as a massive example of a lesson learned. We'll surely never make the same mistake in the future, and we try to ensure all of our friends buying homes realize this detail. It seems so obvious to use now, but as 24 and 25 year olds, we didn't know better. 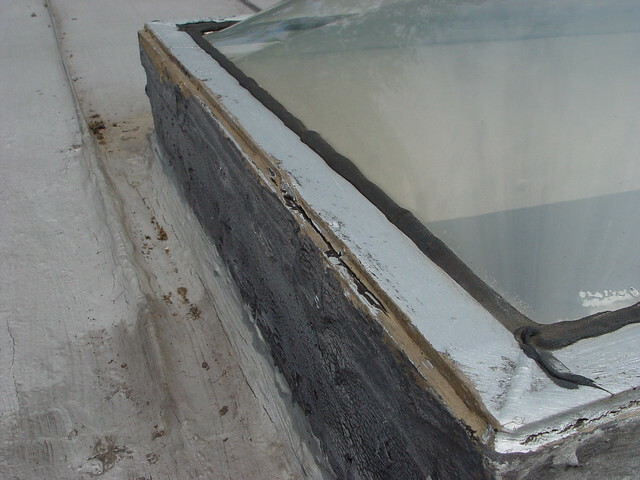 In retrospect we should have known better when our inspector pointed out a broken window pane but told us to ignore the water damage around the skylight because "It was probably old and looked fixed." I know you've probably heard of the wonders of duct tape and its ability to magically fix even the most broken of items, and I'm hear to tell you that it's 100% and absolutely true...sort of. Back when we discovered the massive termite damage following our rather horrible water infiltration on our back kitchen wall, we launched into a massive (for us at least) project to correct the problems. 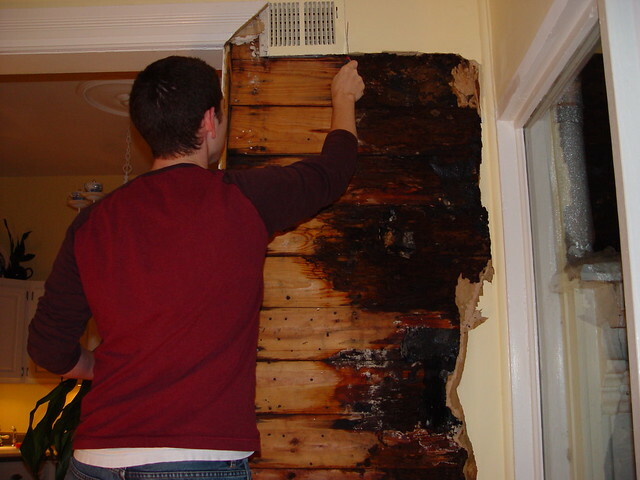 This included the process to expose the rotten away and interior elements of the wall that had been long affected by water and bugs. 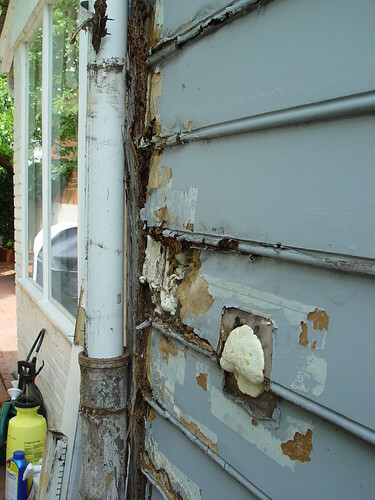 This process ultimately exposed the rotten exterior siding of the home that had been held together by a layer of exterior paint. Once removed, this left fist and larger sized holes from the interior of our house to the outside, allowing the cold winter air to blow right into our house. Mid interior project, and without the funds, time, or weather available to make the necessary exterior fixes, we did the next best thing -- applied duct tape! And that duct tape stayed in place all of the way from January until July. Sure, we had to repair it occasionally, but it worked. 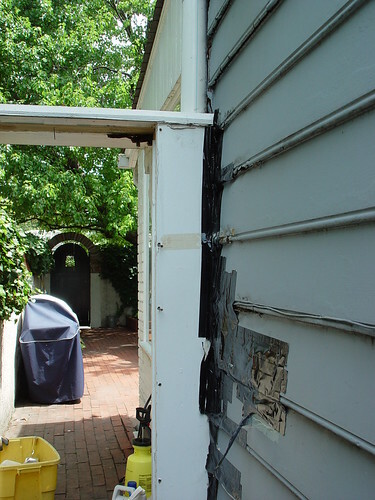 Covering the various holes and openings to protect from water and wind infiltration, our duct tape served as our primary exterior cladding for portions of our home until we could address it more fully. Just look at what it was protecting. The fact that our home is devoid of storm window is, in my opinion, the single biggest disappointment to me and our renovation. I'm 100% and without a doubt fully to blame for our house being colder than it should be in the winter, warmer than it should be in the summer, and more expensive to maintain an adequate temperature during almost any point in the year. I removed our storm windows in 2005 with full intentions of building new ones before that winter. Now seven years later, I have full intentions of building them before this winter...the one we're already in. Yes, the old ones were ugly and triple track aluminum, but they worked. Perhaps, in retrospect, I should have left them in place until I was a bit closer to actually completing, or even beginning, the project. But I'm finally moving (at a snail's pace) on this project. I have visions of storm windows dancing in my head that include quiet nights of sleep, a warm bedroom, and lower heating/cooling bills. I think the only drawback will be when Wendy realizes how much better our house is with storm windows and asks the inevitable question of "WHAT IN THE HELL TOOK YOU SO LONG?!?!?!" Patience is a virtue and we are not often virtuous. Of the various disastrous, trying, and downright discouraging moments we've had renovating our home, we've come to learn this one very important item. When we commit ourselves to something, even when we don't have a clear view on how we might accomplish something, great things can happen if we just have a little perseverance. It may mean a project takes weeks, months, or years longer than it should, but given a little patience and perseverance we can usually look at a finished project with a tremendous amount of pride and fulfillment. More than anything, we simply need to remind ourselves that the before photos would never look quite as bad without the afters, and the afters would never be possible without all of the dust, dirt, debris, blood, sweat, and tears that is collected in the "during" phase of any given project. Through the years we've gone to great lengths to ensure our efforts in turning our house into our home have been performed to the best of our abilities. 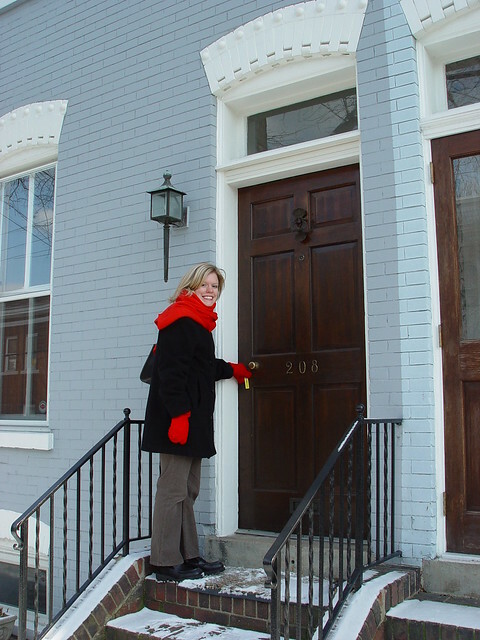 We have the utmost respect for our historic little row house and love it dearly. We also feel we have a duty of stewardship to maintain our home as a piece of the historic fabric of our country, and we hope future (and possibly past) caretakers can see and feel this in our efforts. Our home may not be a grand estate like Downton Abbey, nor is it a location of particular cultural or historical significance, but to us that doesn't mean we should treat it any differently than if it were. We've had a wonderful time building our lives together in our first home over the last 10 years, and in sharing our lives with you over the last several. We can't wait to see what the future brings, but no matter what we know we can handle it as long as it involves a little DIY. Have you had any great milestones in your home that give you a moment to look back on what you've accomplished? Do you look back fondly on your experiences, or are they of the more DIY disaster realm of memories that you'd rather forget? We'd love to hear about it. Congrats on 10 years you guys! Many congratulations! So many great tips in this post. I hope you all do something fun to celebrate! Might wait until tomorrow evening, but I'm sure we'll do something. What's the story behind the bathroom picture? It's very similar to what I have in mind for one of our bathrooms and would like to know more! Yeah, me too! What gives with the bathroom picture - did we miss something? Congratualtions! Excellent tip on the inspector! I always knew you should never let the seller pick and pay the inspector, but I never thought it through all the way to the buyer's agent's recommendation. Good points. HAH! Don't worry, not trying to sneak one by you. That bathroom is actually our guest bathroom that we did several years ago. We've not talked much about it yet, still going over some of our other older projects first. 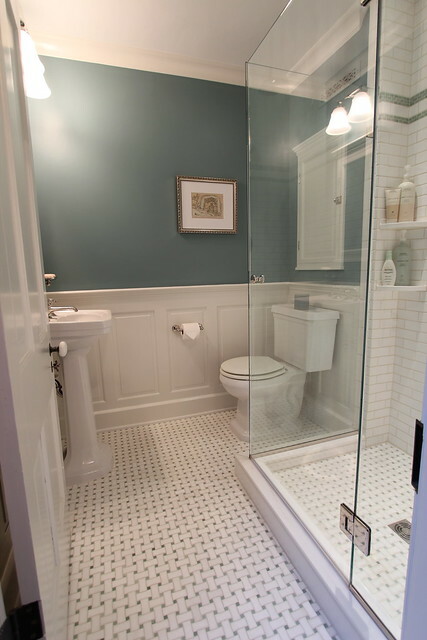 The bathroom is pretty small/tight, but it works for the guest bath. The floor is a basket weave thassos marble floor with handmade tile in the shower. It's right at the top of our stairs so we carried the wainscoting from the stairs into the room for consistency. RE Home Inspector: I really suggest anyone looking for a house find a home inspector BEFORE putting an offer in on a place. Once you have the offer in you usually only have about 7 days to do the inspection. That's a pretty short time frame to research someone, book them, and get them in the property. We went with a large company in our area (one of several suggested by our realtor), who was also recommended by several family members and friends. Since they have so many inspectors I guess results vary by who you get. Ours ended up making mountains out of mole hills, but missed huge problems (such as missing a hole in a giant cast iron pipe in the basement, as well as telling us water damage in our porch was old when it was an active leak). Lesson learned, in the future we will have someone in mind before actively househunting. 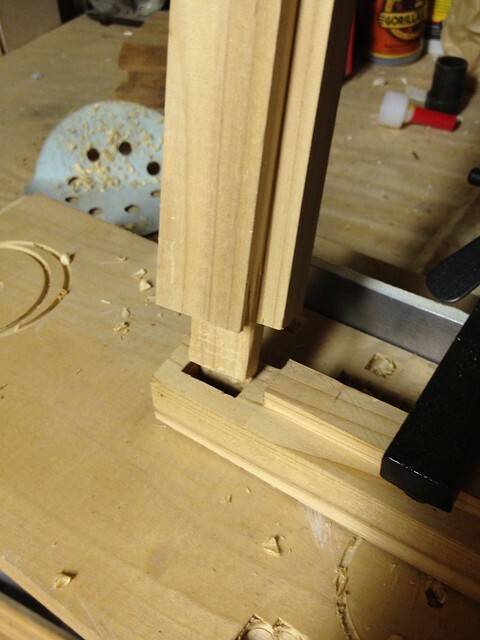 Good tip to secure your inspector early. Back when we were buying our house it was in the era of "waved inspections." I'm sure a lot of people missed some pretty big stuff back then. I think the best inspectors will make a big deal out of everything, then let you decide what really matters. The problem with that is that it requires a lot of information and knowledge to know what is severe and what is not. Congratulations on your 10 year anniversary (in the house, that is)! I hope we will be able to complete half as many projects when we hit that mark. Thanks! I hope you do as well, can't wait to see your place continue to evolve. Congrats on 10 years! While I agree that it's smart to shop home inspectors your write up implies that agents and inspectors are somehow out to rip off home buyers. This may have been your experience based on the market when you bought your home. However, as a an agent I always make sure to recommend thorough inspectors. A bad inspection may kill a deal but I also don't want my clients thinking I have anything other than their best interest in mind. That's my job after all. You're 100% right. I don't want to imply that agents and inspectors are out to get anyone, but it's best to avoid the possible conflict of interest in the event that there is some sort of intentional or unintentional subconscious collusion. When we were buying our home we didn't even know we had the option of using our own inspector (again, young and naive). It was sort of presented as "I have a great guy that you'll use". This left a very bad feeling for us as we learned what we could and couldn't do. I think if it had been presented as "You need an inspection, and I have a few people you can choose from or you can choose your own from the ASHI area list." We would have been much happier in the long run. The key here is to get a reputable inspector. Now that Internet reviews are as mature as they are, it's much easier to do a little background research on the inspector ahead of time. In our case, we didn't even know his name until he showed up for the appointment. I still shake my head at the younger version of us. Congratulations on a whole decade of home ownership!! Aww, thanks so much Whitney! It's great to know that our work has been noticed and appreciated! Congratulations on 10 yrs! All the renovations you've shown came out terrific. The guest bathroom looks awesome! When we bought our first house, we didn't have the greatest home inspector. Ended up finding water damage around doors and windows in several areas. Though I do think that many issues are not visible until renovations begin but with technology today (water sensors, heat guns) maybe some of our issues might have been caught. 2 years in and although we've done a fraction of the work you have, I still have the same feelings! Good call on the home inspector. I agree with another poster whose inspector made mountains out of mole hills, and missed blatantly obvious things. My agent had a selection, and our agent was the daughter of my wife's boss, so she was trying to help us. Afterwards she said she had never worked with the one that I picked from the selection she offered, and then I questioned why he was on the selection in the first place. But it was a national company and I thought we would be safe. Little did I know.... But, at least it was good to know all of the outlets in the house worked, wtf? It's not like I couldn't do that myself with a $5 tool from home depot or even a table lamp. Wow. 10 years! I bailed after 7 on our first home. Amazing. Couple observations..
1. You are either a restoration purist or out of your mind for stripping paint. I suspect a combination of both. :) I replaced our old beat up wood with MDF! hehe. 2. 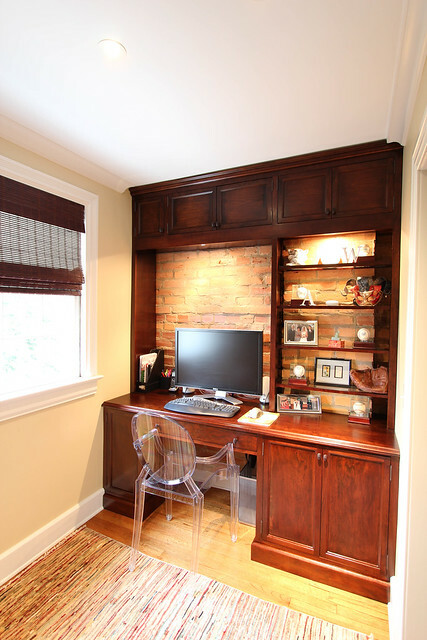 Both your desk AND your bathroom are absolutely beautiful. Thanks for the good laugh, John! 1) Guilty on both accounts.